The popular comedian, 53, was suffering from bone cancer since some months. Hyderabad: Popular Telugu comedian Dharmavarapu Subramanyam, 53, passed away on Saturday night at his residence in Dilsukhnagar. He was suffering from bone cancer since some months. After his first film Jayammu Nischayammura, he went on to act in over 800 films. He shot into fame with Anando Brahma, a popular TV serial on DD in the 1980s. He stayed away from Film Nagar as he did not want his sons to enter the field. The film fraternity was shocked at the death. Initially worked as a government employee, Dharmavarapu Subramanayam, was popular when he directed and acted in ‘Anando Brahma’, a very popular comedy serial on Doordarshan in 1980s. Later director Jandhyala spotted Dharmavarapu’s talent and introduced him in his film ‘Jayammu Nischayammura’ in 1989. Born on September 20, 1960, in Komminenivani Palem, Prakasham district, Dharmavaram has his own unique style of dialogue delivery. Dharmavaram has won many accolades in his film career. He won the prestigious awards like Raghupathi Venkaiah Award, BN Reddy and NTR National Award in his film career. His last film was ‘Shadow’ that was released in this year. He directed only one film ‘Thokaleni Pitta’ with Naresh as the lead actor. He joined in Congress in 2004 and also campaigned for the party. He also served as Chairman for the AP Cultural Association. Generally many film personalities live around Film Nagar area, where all the film studios, shootings will be held, but Dharmavaram lives near Dilsukhnagar too far to that place. Many of his film friends asked him to come to Film Nagar area, but he refused. He says that he doesn’t like to his sons connected to film industry, that’s the reason he stays too far to the industry. The film personalities shocked to hear the demise of Dharmavarapu. Director Puri Jagannath who is a close friend to Dharmavarapu says, that he can’t believe about it. “I had a great rapport with him. Even recently he called me and told me that he will comeback and act in my film. He has a very good sense of humour. He always used to listen old songs. If he is not shooting he will spend the time with listening music. He almost acted in all my films,” says Puri Jagannath. 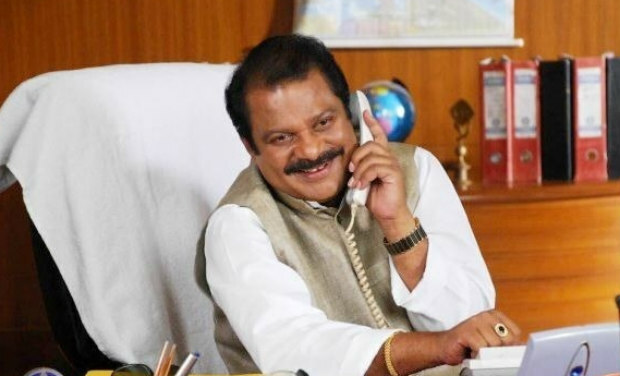 Central Tourism Minister Chiranjeevi and state Cinematography Minister D K Aruna expressed their grief and says that the industry lost a very good actor.